Howard Levy captures his Grammy®-winning sound in this rich library of harmonica lessons. Students in the harmonica course access hundreds of video lessons, backing tracks of many music genres and more. Learn how to play harmonica from a true master. What ultimately sets these harmonica lessons apart from other offerings is the ability to submit a video for review using the ArtistWorks Video Exchange Learning® platform. Howard reviews each submission and records a video response, offering specific guidance to take your harmonica playing to the next level. All students can access the Video Exchange library and watch each other’s interactions with Howard. This library is constantly expanding and may contain the key to unlock your playing. A master of the harmonica for over 40 years, Howard Levy pioneered playing the diatonic harmonica as a fully chromatic instrument including the "overblowing" and "overbending" techniques. Howard has explored multiple genres including Jazz, Classical, Latin and other styles of World Music in his journey. 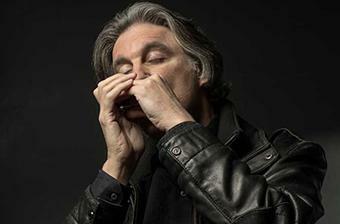 Aside from his prolific work as a solo performer, he is a founding member of the group Bela Fleck and The Flecktones and a member of Trio Globo, Chévere de Chicago and Acoustic Express; and has recorded collaborations with countless industry giants. Howard has been teaching harmonica lessons online with ArtistWorks since 2009. "On Top of Old Smoky"
3rd Position Basic: Dorian Mode and "Scarborough Fair"
3rd Position Basic: "The Star of the County Down"
4th Position C Harp: "Summertime"
12th Position Basic: "Amazing Grace"
12th Position Basic: "Dvorak New World Symphony"
Major Scales and Exercises: "The Star Spangled Banner"
Pentatonic Scale: "Old Joe Clark" and "Black Jack Davey"
3rd Position Intermediate: "Star of the County Down"
Jazz Tune In 3rd Position: "Softly As In a Morning Sunrise"
4th Position Harmonic Minor: "Softly as in a Morning Sunrise"
12th Position Intermediate: "Swing Low Sweet Chariot" & "Amazing Grace"
12th Position Intermediate: "Rhythm Changes"
"Slow Dm Cross Harp Blues"
"Boogie Woogie Blues in D"
Duet Playing: Harp & Guitar (with Chris Siebold) -NEW! Advanced Tongue Blocking: "Beethoven Violin Concerto"
Transposing "How High the Moon"
"Bei Mir Bist Du Schoen"
Artistworks is a great place for musicians. The teachers are excellent and the structure of the lessons leads to improvement. I´m part of Howard Levy´s Harmonica School. Howard opened my mind for totally new spaces of music and I definitly wasn´t the player I am (with all my personal deficits) without his teaching and support! Howard is a virtuoso harmonica player and virtuoso pianist; heard him live with Flecktones this week. Also a marvelous patient ArtistWorks harp teacher for all of us w much less talent! A labor of love - guided by an expert! I am trying to learn to play the harmonica in what spare time I can afford. The basics orf the lessons are quite solid. Without these lessons I would achieve a static level - this allows continual slow improvement related to the time I have to invest. They say it takes 10,000 hrous to master anything, at 300 hours a year that will take me some number of years, but its a labor of love with solid guidance by an expert. Best learning system around. Howard Levyis able to take the mystery out of his extraordinary work and make it accessible to any musician who is willing to work hard. I have learned so much about diatonic harmonica from Howard Levy as well as music styles and modal playing from this great professor. My playing has changed dramatically as a result and so has my perception by others. Plus, Howard is truly a nice person to work with...he provides a personal touch. Inspirational musicians in the team. But (update: not so!) terrible customer service. Howard Levi is an amazing musician and harmonica player. I am very grateful that he has shared his skills and knowledge on this site. For a student to be able to see videos and interact with great artists/teachers is a wonderful opportunity. I think artistworks is great. it is the best way to learn music online. with the video sharing and teachers response. and how you can learn from other students videos.